You’ve seen them on television. You’ve seen them in sales papers. Maybe your best friend or next door neighbor even has one. Air fryers are all the rage, and you want one, too. The problems is, this useful, kitchen gadget seems to be priced outside of your budget. Never fear, because you can buy an air fryer on any budget and even as low as $50-$100. You can cook outstanding, crispy, juicy meals with either expensive or cheaper priced air fryers. Simply choose the best air fryer available within your price range. The compact design makes it an ideal appliance for efficiency apartments, dorm rooms, and minimalist kitchens. Check out this guide on whether or not you should even buy an air fryer. Are Air Fryers Worth the Cost? Are the less expensive air fryers of good quality? Are they just as good as the pricier models? Why should you buy an air fryer, anyway? We’re here to answer all of these questions and more. Air fryers are beneficial for a number of reasons. They are more energy efficient than conventional ovens, requiring less preheating time, less cook time, and less electricity to operate. The food is touted as being a healthier alternative to deep-fried treats because it uses much less oil – 75 to 80 percent less, on average. Below we share 5 tips for buying an air fryer on any kind of budget. Once you have chosen a few brands that have the features you like, avoid reducing the size to save on price. While that may be a reasonable consideration for buying cars, air fryers work more like real estate, and every usable inch pays for itself. If you are trying to get a real bargain on an air fryer, it is important to decide which features are most important to you. Paying the most won’t necessarily buy you a better air fryer. The bottom line is, these features are fancy and fun, but not necessarily better. Even the most basic models have built-in temperature controls and settable timers, all you need to get the job done. When buying an air fryer on the cheap, you’re not likely to get any extras with it. Keep in mind, however, that the basics – the pan and basket that are integral to every air fryer – will allow you to cook nearly anything you could imagine. With a bit of creativity, you may find other oven-safe dishes, such as mini cake pans, that will fit in the small fryer’s basket. Accessories can always be purchased at a later date. There is always an air fryer ‘on sale’. With over 100 models on the market, that’s no surprise. Not only do the manufacturers have sales, but the big box trusted retailers such as Amazon, Walmart, and Best Buy do as well. If budget truly is your top concern, opt for a smaller fryer. We recommend going with at least three or four quarts as a minimum. This gives you plenty of cooking capacity for meals without breaking your budget. You can find a great deal on air fryers of all sizes with a little research and patience. Competition among retailers leads to numerous deals so keep your eyes open during holiday and sale events. Air fryers on the on the market today range in price from around $50.00 to well over $300.00. The highest priced air fryers can be as much as $299.99. In most cases, smaller air fryers will cost less than those that are larger. While larger air fryers may be more suitable for feeding bigger families, you can get the same cooking performance from a fryer of any size. If you are looking for the best bang for your buck, the larger air fryers are most cost-effective. GoWise USA is one of the most popular brands on the market today. 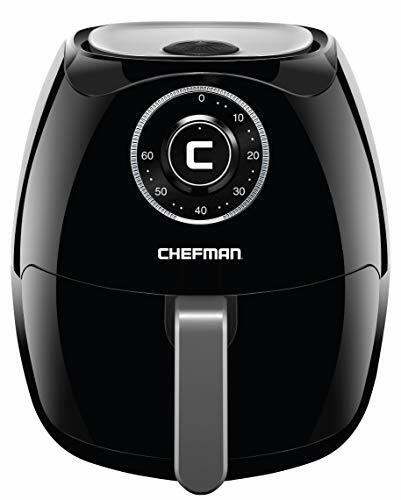 Their products range in size from the economical 2.75 quart air fryer to the 5.8 quart XL. Most models feature digital displays with a soothing blue back light, but dial controls are also available. For the budget conscious, refurbished models can be purchased directly from the manufacturer. 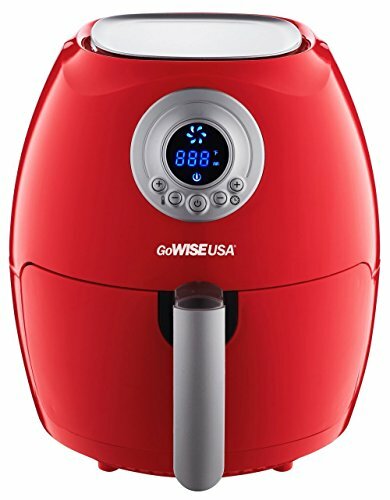 GoWise is based in Phoenix, Arizona and upholds the goal of making “your life easier and maybe even healthier.” All air fryers are FDA approved and ETL certified. Cozyna produces a 3.7 quart model as well as a 5.8 quart XL model. Numerous accessories are available, including racks, baking pans, pizza pans, and muffin tins. 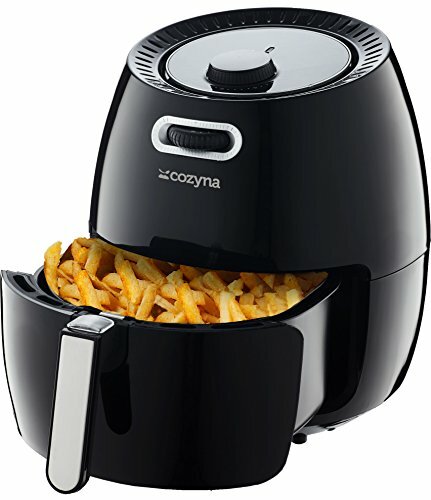 The Cozyna air fryer has been endorsed by both Buzz Feed and Hungry Girl. The truth is, you don’t have to have the most expensive air fryer to get the job done. 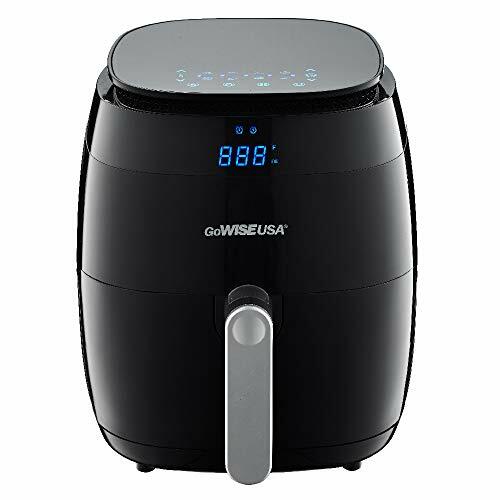 One example is the 3.7 quart low noise air fryer produced by GoWISE USA. This air fryer is on the low end of the price spectrum. Yet, it offers a colorful digital display, a dishwasher-safe basket and drip pan, a egg-shaped design that allows for more capacity in a small package, and a good warranty. And, it will cook your food just like the big guys. You can obtain a high-quality air fryer on a budget. The above models are proof that there are numerous models available for under $100.00. If you’ve got an extra c-note in your pocket, buy yourself an air fryer today. Your taste buds will thank you. Popularity breeds imitation, and you’ll see some models with tempting prices. In the end, these generic brands might not offer much value for your dollar. Before buying an appliance without a brand name, check the product’s warranty and the retailer’s return policy. If you run into problems associated with cheap manufacturing, like baskets with finishes that chip off, you’ll want the ability to get a replacement or a refund. Amazon and some other online retailers, however, might not be as reluctant to deal with generic air fryers of unknown quality. Watch out for third-party sellers with no-name products on online platforms. With so many sales and discounts available, choosing a ‘no name’ brand because it is cheap is usually a big mistake. In addition to poor functionality, there are multiple reports of such air fryers not working from the start, not working after a few uses, and worse, starting small electrical fires. Spend a few extra dollars so you know you won’t have to replace within a few months.